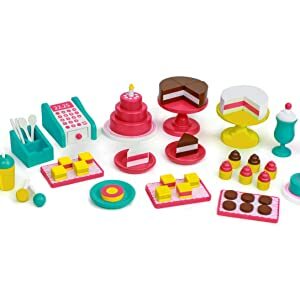 Fun Accessories: The bakery set includes 50+ cake and baking accessories including Cash Register, Silverware, Sundaes, and Cakes, Pies, Cookies and More! Our Eimmie Doll Bakery Set comes packed with tons of goodies to make each bake sale come to life! Each bake sale set comes with a cash register, bake sale sign, bakery stand, cake, cupcakes, milkshakes, and other baked goods!